. The Fechins moved into the house, located on the main street of Taos, Paseo del Pueblo Norte. They lived there until March of 1928 when it was concluded that the two-story, eight-room, cube-shaped symmetrical adobe failed to satisfy their needs functionally or aesthetically and they would have to remodel. For the next five years, the Fechin family labored to make the home theirs. Nicolai planned, and the multi-lingual Alexandra communicated directions to masons from the Taos Pueblo, one of the town's "well-known carpenters and a metalsmith." Nicolai worked day and night. The arrival of electrical and water systems in Taos in the fall of 1928, and a modern sewage system that arrived in 1930, made it possible for Nicolai to carve and build at night while he painted during the day. The Fechins' workmen removed all interior, non-load bearing walls and reconfigured the space. They doubled the size of the front porch and added a series of rooms that projected from what was once the central cube. The final result was an asymmetrical adobe Pueblo and Mission Revival house, with twenty-four-inch walls. The Fechins created a wonderful home and a masterpiece of Southwest architecture that celebrated a marriage of the arts: painting, sculpture, drawing, and metalwork. The spaces within the home were sympathetic to Nicolai's art collections as well as his carvings of sculpture, furniture, and architectural ornament. Working in his father's workshop as a youth provided training for Nicolai as a carver. He absorbed a variety of influences from his Russian heritage and also from his encounters with Native American and Hispanic cultures. Armed with mallet and chisel, he began carving columns, stair rails, vigas, doors, and furniture. With the local metal smith, he fashioned light fixtures, door pulls, and hinges. By 1933, Nicolai and Alexandra, with their workmen, had created one of the most exciting homes in Taos. Eya stated, "A Russian house evolved out of New Mexico mud." Unfortunately, the family's joy was short-lived. The couple experienced marital problems, and Nicolai, with his daughter, left their home in Taos. Alexandra stayed in the house and assumed the responsibility of maintaining the property until her death in 1983. Nicolai and Eya returned to New York before settling in California, where he died in 1955. After Eya returned to New Mexico, she accepted responsibility of caring for the house. In 1979, the Fechin House was placed on the National Registry of Historic American Homes. Eya also opened the house to the public as a museum. Living in the studio, she created the Fechin Institute and maintained active exhibition and education programs until her death in November 2002. The Board of the Taos Art Museum at Fechin House is responsible for the exhibition, interpretation, and care of a collection of approximately 600 paintings, drawings, and prints and other artifacts of the Taos founders and those who followed. To accommodate these collections and programs, the Board acquired the Fechin property and immediately began to renovate the house and studio and landscape the grounds. They provided the house with much-needed repair, installed security and track lighting systems, treated the windows to eliminate harmful ultra-violet rays, and refinished the interior walls and the hardwood floors. On the exterior, the white adobe surface was restored. The Taos Art Museum at Fechin house opened officially in July of 2003, and welcomed the public with a reception in September, celebrating a new home in Taos for the art of Taos, which has been collected as far afield as Corning, New York; Orange, Texas; Tulsa, Oklahoma; and Los Angeles, California. The Museum honors families who were major patrons: Gerson Gusdorf and Melvin Weimer, Duane Van Vechten and Edwin Lineberry, Eya Fechin, Nelda C. and H.J. Lutcher Stark, and William J. Klauer, among others. The museum also recognizes other individuals and institutions who supported artists, including museums, the federal government, the Santa Fe Railway, the media and, of course, other artists. Virtually all full and associate members of the Taos Society of Artists are represented in the Museum’s collection. Bert Geer Phillips was the first of the group to take up year-round residency in Taos in 1898. He opened doors by establishing close relationships between the Native Americans and artists who joined him in succeeding years. He is represented by a vividly colored portrait, Warbonnet Shadows. Cincinnatian Joseph Henry Sharp, the 'ethnographer' of the Taos artists, stated: "If I don't paint them [the Native American] no one ever will." In this effort, he painted more than 10, 000 canvases, many of which are three-quarter portraits such as Montana Blackfoot Indian. Eanger Irving Couse was nearly as prolific as Sharp. In 1920 he stated, "My interest has always been the domestic side of the Indian rather than the usual conception of the Indian always on the warpath." He was the first to achieve a national reputation through his success in the National Academy of Design's juried exhibitions. He also created twenty-three images, similar to Fireside Indian, that were reproduced on the Santa Fe Railway's annual calendars. He popularized a kneeling Native American in interior settings, illuminated by man-made fire. These paintings are beautiful examples of how three artists with strong academic backgrounds produced striking and sometimes romanticized canvases of Native Americans. After Ernest Blumenschein's initial visit to Taos in 1898, he and his wife traveled to Europe and returned to Taos seasonally until the late 19010s. His European training as well as his mature work in Taos is represented in the collection, notably Taos Landscape. In the 1920s, critics referred to Blumenschein as a decorative painter, a reference to his bold form of modernism. In addition to painting, he was also deeply involved as a violinist. In his Indian ceremonials and landscapes, the viewer is made conscious of his interest in strong colors, bold forms, and poetic rhythms. With a background in commercial illustration, the St. Louis-born Oscar E. Berninghaus, an acute observer of life in and around Taos, painted Watching the Ballgame. Berninghaus claimed that he was "infected with the Taos germ" and was "fascinated by the people, the Indians and Mexicans, the adobe architecture, the sagebrush, the mountains, they all inspired me as a subject matter." Baseball was a favorite community pastime for Native Americans, Hispanics, and Caucasians alike. In fact, when fellow artist Blumenschein wasn't painting, trout fishing, or playing the violin, he played on the Taos team until he was fifty. 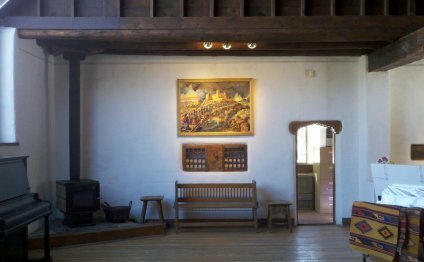 Watching the Ballgame, like so many of Berninghaus's canvases, is a wonderful example of contemporary life in northern New Mexico.